FREE SPITFIRE SIMULATOR FLIGHTS FOR GIRLS AGED 8 TO 80! To mark the 75th anniversary of the first British women flying a fighter (see http://www.maidenheadheritage.org.uk/ata-news-events ) we are offering for this week only (19-23 July) a free 15 minute Spitfire simulator flight to all female visitors to our Grandma Flew Spitfires exhibition. Please phone 01628 780555 to book your flight. Congratulations from everyone at Maidenhead Heritage Centre to our MP Theresa May on becoming the UK’s second woman Prime Minister today, July 13th 2016. 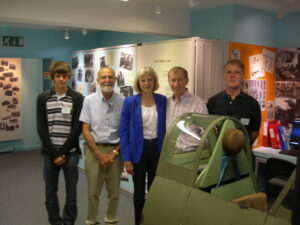 The new PM has been a long-standing supporter of Maidenhead Heritage Centre, and on a private visit with her husband Philip she flew our Spitfire simulator. She took off from White Waltham and then became the first Home Secretary to ‘land’ a Spitfire at Heathrow Airport. On our facebook page (click on the symbol at the bottom of this page) you will find film of her having a flying lesson from our Chairman Richard Poad. He commented on the ease and speed with which Theresa absorbed his instructions. “She has plenty of practice with all those red boxes which keep her up half the night!” said Richard. You too can have a Spitfire simulator flight – just phone 01628 780555 to make a booking.